> Who Paintin' Dis Wandjina? The film Who Paintin' Dis Wandjina? 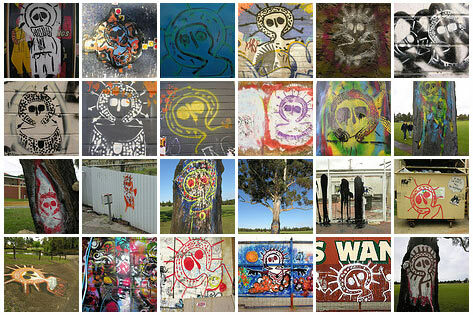 examines the impact of hundreds of spray-painted images of Wandjinas (pronounced 'wannias') in Perth and surrounds. Wandjinas symbolise the creator of fertility and rain for the Mowanjum Aboriginal peoples in the Kimberley of northern Western Australia and are not part of the culture of the Noongar Aboriginal people of Perth in the south. In the documentary Aboriginal elders express concern about the Wandjinas being taken to Perth. They are 'hurt' by the thoughtless use of a symbol which has to have a story and a meaning behind it in order to be replicated. "It's more than a painting, it's a lifestyle," they say. Following proper cultural protocol, only Aboriginal people who went through the law are allowed to use Wandjinas. In Who Paintin' Dis Wandjina? director Taryne Laffar also lets the graffiti artist speak without revealing their identity. For a culturally appropriate way to learn more about Wandjinas check out the Mowanjum Artists Spirit of the Wandjina Aboriginal Corporation (MASWAC). "As an aboriginal, I am upset at the way my choice to greet and respect the Wandjina (law) has been taken from me. You aren't supposed to just walk up to Wandjina and take a photo. You aren't supposed to look at him unless the correct rites have been conducted. Its disrespectful. "—Aboriginal commentator [[#1 http://rosemary.id.au/view/blog/wandjina/]]. Learn it from Aboriginal people: The book Keeping the Wanjinas Fresh tells the story of Sam Woolagoodja, who was responsible for repainting the sacred Wandjinas in many of the rock shelters of the Kimberley.